New view of the Pillars of Creation — Visible Light. Click to Enlarge. Now Hubble has revisited the famous pillars, capturing the multi-colored glow of gas clouds, wispy tendrils of dark cosmic dust, and the rust-colored elephants’ trunks with the newer Wide Field Camera 3, installed in 2009. The visible-light image builds on one of the most iconic astronomy images ever taken and provides astronomers with an even sharper and wider view. 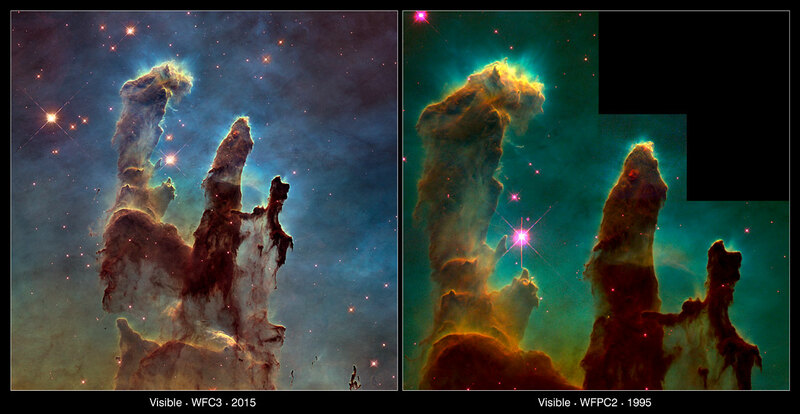 Although the original image was dubbed the “Pillars of Creation”, this new image hints that they are also pillars of destruction. The dust and gas in these pillars is seared by intense radiation from the young stars forming within them, and eroded by strong winds from massive nearby stars. The ghostly bluish haze around the dense edges of the pillars in the visible-light view is material that is being heated by bright young stars and evaporating away. 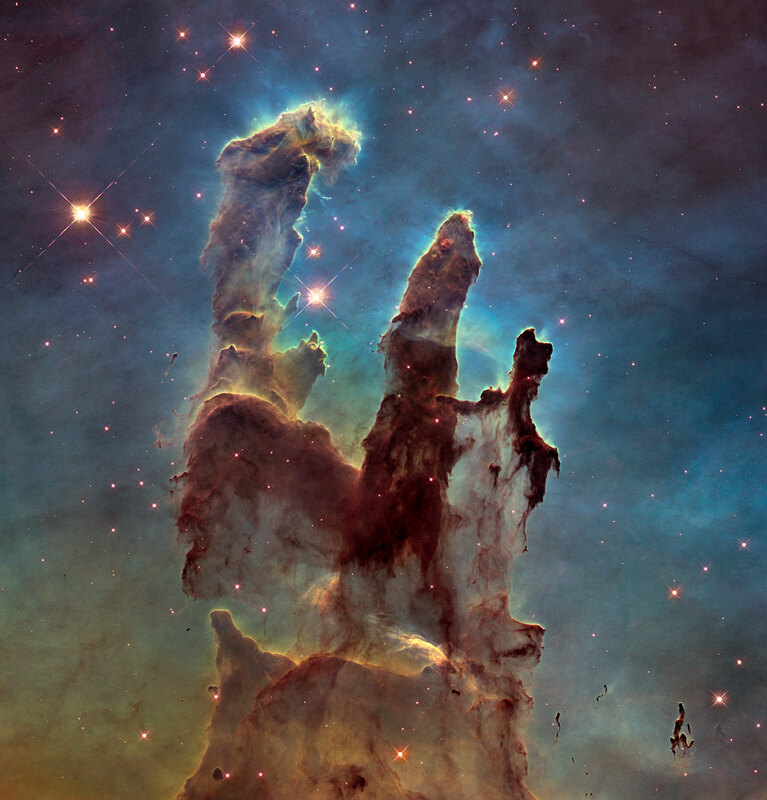 Although structures like these exist throughout the Universe, the Pillars of Creation — at a distance of 6,500 light-years away — provide the best, and most dramatic, example. Now, these images have allowed us to see them more clearly than ever, proving that at 25 years of age, Hubble is still going strong. This entry was posted in Uncategorized and tagged "hubble space telescope", astronomy, astrophoto, Eagle Nebula, ESA, Hubble, NASA, Pillars of Creation. Bookmark the permalink.